Bella Bamba, a 3D brightening pink face powder and Hoola, bronzing powder (3.0g). It has 3 colours and they are CORALista (coral pink cheek powder), Bella Bamba (3D brightening pink face powder), and Hoola (bronzing powder). Ello sayang!!! :DD Thanks for having this giveaway! Thnaks :) Looking forward for your next post!!! Benefit Powder Wowza has three colors. 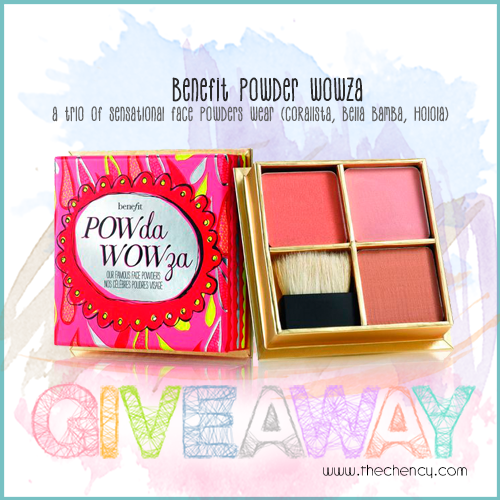 The Benefit POWda WOWza is a trio of three sensational face powders namely CORALista which is the coral pink cheek powder weighs 3.0g, Bella Bamba which is a 3D brightening pink face powder weighs 3.0g and Hoola which is the bronzing powder weighs 3.0g. 1.CORALista, coral pink cheek powder. 2.Bella Bamba, a 3D brightening pink face powder.